Briarpatch Magazine: What’s at Stake in the Fight for $15? On Wednesday morning, April 15, Amelia White left her Scarborough, ON apartment and began her trip downtown. Born in Jamaica, she’d moved with her mother to Lethbridge, AB in the ’70s. It was a lonely time; she remembers being the only black family in the small prairie city. The family soon moved to Winnipeg, where she lived until coming to Toronto five years ago. She likes the city but says she still isn’t used to the crowds. A short time later, White was on a bustling Toronto street outside the Ministry of Labour, shoulder-to-shoulder with hundreds of others. The crowd – a mix of union members, students, and activists – was rallying under the banner of “$15 & Fairness,” calling for a higher minimum wage and legal protections to ensure decent work. White is a member of the Workers’ Action Centre (WAC), a community organization dedicated to organizing low-wage workers, which had planned the protest with a coalition of other groups, including the Ontario Federation of Labour, Health Providers Against Poverty, and the Canadian Federation of Students. Unions and community groups held similar demonstrations in about a dozen cities across Canada. Worldwide, tens of thousands in over 40 countries participated in the April 15 mobilization. The events were inspired by the “Fight for $15” movement in the U.S., where low-wage workers, especially those in the fast-food industry, have managed to secure a $15 hourly wage in several West Coast cities. Three weeks later, Canada’s minimum wage movement experienced an unexpected boost. On May 5, Albertans elected an NDP majority, unseating the long-ruling Progressive Conservatives. Premier Rachel Notley quickly reaffirmed her campaign commitment to be the first jurisdiction in Canada to have a $15 minimum wage. As of October 1, Alberta’s minimum wage increased from $10.20 to $11.20 an hour. By 2018 it will be $15. Across Canada, almost seven per cent of workers make minimum wage. Of these workers, more than 40 per cent are under 20 years old. 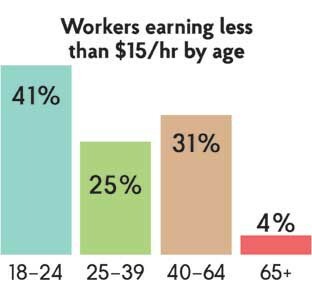 The right-wing Fraser Institute points to these numbers and argues that the issue only concerns “young people still living at home.” But the picture changes when you consider those who are being paid less than $15 an hour. 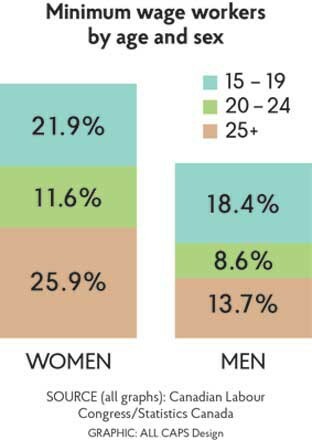 Sixty per cent are 25 or older, and 35 per cent are over 40. 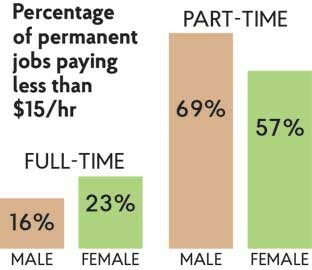 Women make up 59 per cent of low-wage workers across Canada. Economist Sheila Block has found that in Ontario, racialized workers are 47 per cent more likely than the non-racialized population to be working for minimum wage; recent immigrants are also disproportionally represented. In Alberta, the Canadian Federation of Independent Business (CFIB) has led the charge against the incoming wage increase. They argue that the raise will result in a loss of between 50,000 to 180,000 jobs, due to increased costs to employers. And, they say, it won’t reduce poverty. David Green, a professor at the Vancouver School of Economics at UBC and an international fellow at the Institute for Fiscal Studies in London, disagrees. In a study of the economic literature, he found that employment losses as a result of wage gain were focused primarily on teenagers and small numbers of young adults. For those over 24 years old, there was no discernable effect. Across Canada, the gap between minimum wages and the low-income cut-off – the threshold at which people begin to spend more of their income on necessities than the average – leaves many full-time workers substantially below the poverty line. “You need to raise the wage substantially to address poverty,” says Ian Hussey, research manager at the Parkland Institute, a left-leaning think tank in Alberta. But now is not the right time, argues the CFIB. Alberta and Canada are in a recession. Employment insurance claims are at their highest levels since 2009, with Alberta and Ontario seeing the largest spikes. The CFIB argues that instead of raising the wage, the government should invest in targeted training programs and offer tax relief to low-wage workers. “Business will have to make tough decisions in a climate like this,” says Amber Ruddy, director of provincial affairs for CFIB Alberta. Since the first walkout of fast-food workers in New York City on November 29, 2012, the U.S. “Fight for $15” movement has pursued a strategy of one-day public mobilizations targeting low-wage employers. Unlike a strike, the workers haven’t aimed to shutter their workplaces; they’ve focused instead on mobilizing large numbers of people to put public pressure on employers and governments. As in Canada, workers in the United States are protected from employer reprisals for trying to organize a union. In addition, the National Labor Relations Act protects activity by non-unionized workers who are engaging in “concerted activity,” when two or more employees take action “for the purpose of collective bargaining or other mutual aid or protection.” This broad protection may be a key element in their fight. “There is no equivalent [in Canada] to protection for ‘concerted activity’ on the part of workers unless it’s in the context of forming a union or association,” says Adrienne Telford, a Toronto lawyer who specializes in labour and constitutional law. Notwithstanding the recent New York State wage board recommendation to set fast-food workers’ wages at $15 per hour, all of the minimum wage victories have been won at the city level. 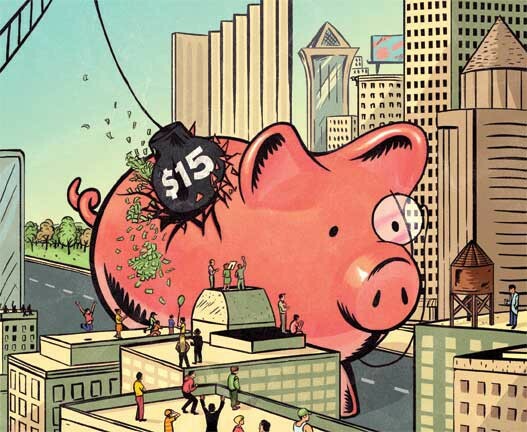 Cities are fertile ground for wage-hike organizing. In Los Angeles, for example, where city council passed a $15 minimum wage in May 2015, it’s estimated that half of all workers earn less than $15 an hour. The cost of living is higher for all residents in urban areas, low-wage or not, opening up the possibility of wider sympathy for a pay increase. And political representatives are near at hand. But in Canada, cities don’t have the constitutional authority to legislate a minimum wage – provinces and territories do. It was a municipal ballot initiative that brought forward the first $15 minimum wage in North America, in the small city of SeaTac, 22 kilometres south of Seattle. In about half the country, supporters can collect a prescribed number of signatures and have a “ballot measure” presented to the voters at large in the next election, similar to a referendum. If it passes, the measure becomes law. Activists in Canada may not be able to use the same tools. In most provinces, referendum results are non-binding, and excluding Saskatchewan, it is only the government, not eligible voters, that can put forward a referendum question. “The SeaTac campaign was not initially a wage campaign. It was an organizing campaign,” explains Jonathan Rosenblum, former campaign director for the SeaTac airport organizing campaign for the Service Employees International Union (SEIU). The campaign began by tackling unfair supervision, health and safety issues, and religious discrimination against Muslim workers. These small interventions built people’s trust in each other, and their confidence in collective action. On November 5, 2013, voters narrowly approved the ballot initiative, which raised the wages of 6,300 transportation, hospitality, and fast-food workers at the SeaTac airport and related businesses. An employer-led legal challenge succeeded in limiting the number of workers covered by the $15 wage, but on appeal, the Washington State Supreme Court upheld the original terms of the wage increase. Around the same time, Kshama Sawant, an avowed socialist, was elected as a Seattle city councillor. She had called for a wage increase, as had the successful mayoral candidate, Ed Murray. On June 2, 2014, Seattle city council unanimously approved a $15 minimum wage, to be phased in by 2018. In a concession to employers, for the first few years, people who receive tips and health benefits will have to count them against their wages. Soon other cities were following their lead. San Francisco voters approved a $15 ballot measure in the fall of 2014, and Los Angeles city council voted in an increase in May of this year. Now those politics have drifted north, to the benefit of about 250,000 low-wage workers in Alberta. The struggle has even registered nationally, with NDP Leader Thomas Mulcair calling for a $15 hourly wage for federally regulated employees. The story has been different in B.C. and Ontario, where the mobilization for $15 an hour is an evolution of previous minimum wage campaigns, led not by politicians, but by worker organizations, community activists, and unions. White was involved in the 2011 Ontario campaign to raise the wage to $14. She remembers the moment Ontario Premier Kathleen Wynne announced the $11 wage. The WAC, which had built momentum through a series of monthly actions held on the 14th day of each month, was invited to the press conference. At a downtown coffee house, the premier, flanked by Minister of Labour Yasir Naqvi, explained that the increase was all she could do for now. It wasn’t good enough for White. Such moments, where workers are able to speak truth to power, can help keep spirits up. But how can a movement build the power, influence, and momentum needed to achieve its goals? Only a handful of grassroots groups in Canada have the funding to organize low-wage workers: the Ontario Coalition Against Poverty, the Association of Community Organizations for Reform Now, and the Immigrant Workers Centre in Montreal. The labour movement has supported (and, in some cases, led) the minimum wage campaign, but unions here have not made an investment on the scale of their American counterparts. SEIU, one of the largest unions in the U.S., has contributed $23 million to the “Fight for $15” campaign in 2014 alone, primarily by funding local community groups that organize with workers, such as New York Communities for Change and Working Washington in Seattle. Anti-union groups such as Worker Center Watch have seized upon the numbers, characterizing the minimum wage fight as a “Ponzi scheme” that wastes union members’ dues on employing “rent-a-mob” worker centre activists. A number or an idea? Gloria Yogyog spends her weekday mornings outside a Vancouver SkyTrain station, offering bleary-eyed commuters a copy of a free daily newspaper. The job, just 15 hours a week, pays $10.50 an hour. On her off-hours, Yogyog is happy to keep handing out flyers, but these are for ACORN and the minimum-wage movement. She’s been an active member of the community group since 2010, working on campaigns for better housing and for banks to lower fees on remittances sent by workers to family overseas. 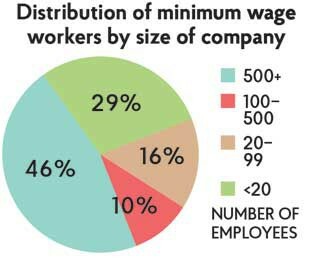 Yogyog, and White in Scarborough, stand to benefit directly from a higher minimum wage. But they know the fight won’t be easy, and that they can’t do it alone. The demonstration in Toronto on April 15 was not White’s first in front of the Ministry of Labour, a frequent target of workers’ protests. But the day ended differently than at previous protests. Together with Cocq and members of WAC, White boarded a bus headed for the airport. Workers from the Toronto Airport Workers’ Council were rallying outside the departure lounge, calling attention to contracting out and low wages. Many of them work for less than $15 an hour. WAC is hoping to build on this new relationship, strengthening the fight for wages and decent work. Hours later, White begins the long trip from Pearson Airport in Mississauga to her home in Scarborough. “It was a good day,” she says.